Shown above: 2 Plantation Club Chairs, and 1 Plantation Sofa. Want to encourage relaxation and retreat in your habitat? Bring the tropics to your home with the grand, vibrant Plantation Teak Outdoor Furniture Collection. Creating an atmosphere of peace and tranquility; the Plantation Teak Outdoor Furniture Collections design is pulled from the grand, early century homes of plantations in Jamaica, Africa and Indonesia. 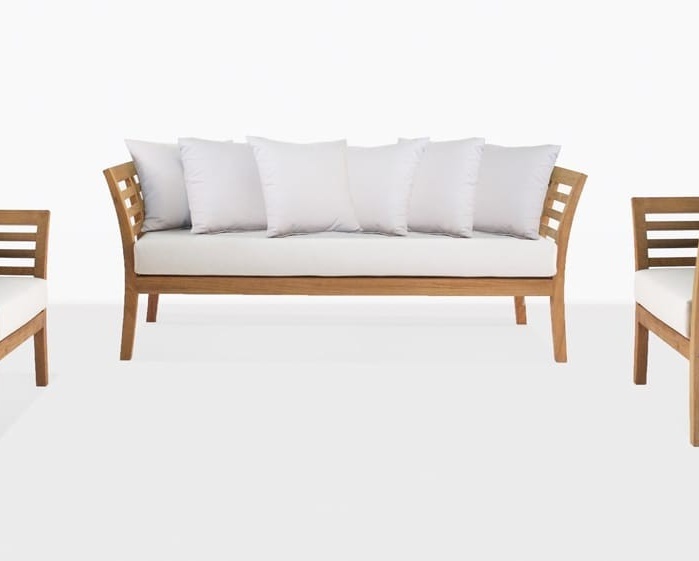 The Plantation Teak Outdoor Furniture Collection is small but perfectly formed. Made up of just two beautiful pieces; the Plantation Sofa and the Plantation club-style Outdoor Lounge Chair. Taking on a simple, stylish slatted design; the frame invitingly flares out at the top of each piece, highlighting the beauty of the wood and the excellent craftsmanship. The Plantation Outdoor Sofa gives you the option of having a luxurious daybed or a glamorous sofa, perfect for long hours of relaxing and entertaining. A Plantation Outdoor Lounge Chair or two can be added to an area including the outdoor sofa for extra seating, and will take on a meditative quality when isolated in a garden or facing the ocean. In addition to the stunning charisma of the pieces, we have for the first time added a range of exquisite, colorful Sunbrella® throw cushions so you may really imagine yourself into your favorite tropical destination! The mastery of each piece comes down to the precise placement of beautiful slats of sought after A-Grade Teak, fixed with marine grade glues and stainless steel. The bench style cushion is comprised of Sunbrella® fabric. Choose from Taupe, Canvas or Coal cushions to articulate a look that works brilliantly in your space! The Sunbrella® cushions are FREE with your purchase of either the Plantation Outdoor Sofa or Outdoor Lounge Chair!